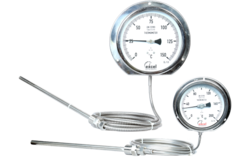 Pioneers in the industry, we offer bimetallic temperature gauge and gas filled temperature gauge from India. By utilizing skills of our dexterous workforce, we are offering a comprehensive assortment of Bimetallic Temperature Gauge. Our vendors manufacture this gauge by employing finest quality raw material and advanced technology in adherence to the set industrial norms. Owing to features like accurate design and easy installation, our offered gauge has been able to earn a lot of recognition in the market. 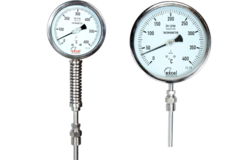 Clients can avail the entire range of gauge from us in various sizes and at affordable prices.